Braille is a tactile system of reading and writing for use by the blind or visually impaired. 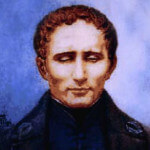 Braille is named after its creator Louis Braille (1809 – 1852). In 1824, at the age of 15, Braille presented his ideas for a system of tactile code that could allow blind people to read and write quickly and efficiently. Braille is not a language, it is another way to read and write a language. Characters are represented by an arrangement of raised dots. Each braille character or cell is made up of six dot positions, arranged in a rectangle comprising of two columns of three dots. A dot may be raised at any of the six positions to form many combinations. Counting the space in which no dots are raised, there are sixty four such combinations. For reference purposes, a particular combination may be described by naming the positions where dots are raised, the positions being universally numbered 1 through 3 from top to bottom on the left and 4 through 6 from top to bottom on the right for example, dots 1-3-4 would represent a cell with three dots raised, at the tip and bottom in the left column and on the top right of the right column. It is possible to transcribe braille by simply substituting the equivalent braille character for its printed equivalent, such a character-by-character transcription, known as Grade 1 braille. Grade 1 braille is recommended for pharmaceutical and medicines packaging. The braille alphabet, numbers and symbols of Grade 1 (uncontracted braille) differ around the world. Refer to the braille codes area for more information on country codes. Braille characters are much larger than their printed equivalents, and the standard 28 cm × 28 cm page has room for only 25 lines of 40 characters. To reduce space and increase reading speed, virtually all Braille books are transcribed in what is known as Grade 2 braille, which uses a system of contractions to reduce space and speed the process of reading. Grade 3 braille is a system that includes many additional contractions, almost a shorthand; it is not used for publication, but is used mostly for individuals for their personal convenience. Pharmaceutical Braille guidelines recommend Grade 1 Braille (un-contracted Braille). PharmaBraille fonts are Grade 1 braille.